As part of our Gumnut Babies centenary celebrations we collaborated with one of Australia’s favourite bedlinen and homewares brands Kip & Co to create the May Gibbs x Kip & Co Limited Edition collection. Enter now for your chance to win a piece of history in celebration of 100 years of May Gibbs’ Gumnut Babies. To enter, complete the entry form below and tell us which prize pack you’d most like to win and your special bedtime ritual that you share with the kids before snuggling down to sleep. Our three favourite answers will win one prize pack each. Follow May Gibbs Official on social media for your chance to win bonus prizes! Competition closes 11.59pm Sunday 27th November 2016. Open to Australian residents only, Full terms and conditions linked below. Tell us which prize pack you'd most like to win and the special bedtime ritual you share with the kids before snuggling down to sleep? The competition will be open from 5.00 PM Australian Eastern Standard Time (“AEST“) on Thursday, 17th November, 2016 and will continue until 11.59 PM AEST Sunday, 27th November, 2016 (“Promotion Period“). Click ‘Submit’ to confirm the entry. To enter the bonus draws, you must also be a fan of the May Gibbs Official Facebook page or a follower of May Gibbs Official on Instagram. This is a Competition of skill and chance plays no part in the determination of the Winner with three (3) Winners awarded one of three Major Prizes and two (2) Winners awarded one of two Bonus Prizes. Subject to the Entrant complying with these terms and conditions, the first three valid Entries selected will each win one of three Major Prizes and the following two entries selected will each win one of two Bonus Prizes. Judging of the Prize from all Eligible Entries received during the Promotion Period will take place within three days following the competition close date. The judging will take place at Merchantwise Pty Ltd of 1/ 266 Chapel St, Prahran, VIC, 3181 and will be conducted by a representative of the Promoter. 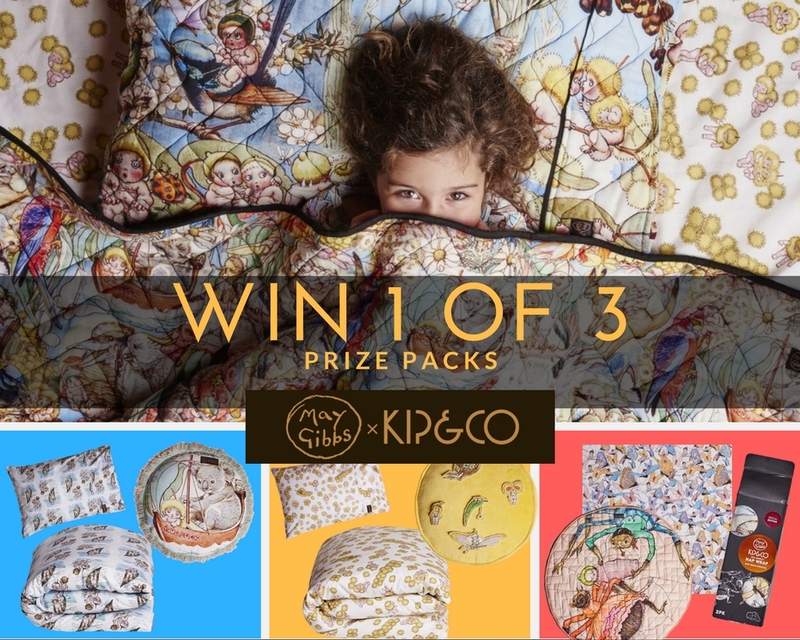 There will be three Major Prize winners selected by the judges, based on skill, and the winning entries shall receive one of three May Gibbs x Kip & Co prize packs. There will be two Bonus Draw winners from the May Gibbs social media communities on Facebook and Instagram selected by the judges, based on skill and the winning entries shall receive one of two May Gibbs x Kip & Co products. The Prize winners names will also be published on the May Gibbs Facebook page (facebook.com/MayGibbsOfficial), the May Gibbs Instagram page (www.instagram/maygibbsofficial) and also on the May Gibbs website (www.maygibbs.org) for a period not less than 28 days. This Competition is in no way sponsored, endorsed or administered by, or associated with, Facebook or Instagram. Users understand that they are providing their information to the Promoter and not to Facebook and Instagram. The information an entrant provides will only be used for the purposes outlined in these Terms and Conditions. Any questions, comments or complaints about this Competition must be directed to the Promoter and not to Facebook or Instagram. Facebook and Instagram will not be liable for any loss or damage or personal injury, which is suffered or sustained by an entrant, as a result of participating in the Competition (including taking/use of an offer except for any liability, which cannot be excluded by law. The Promoter accepts no responsibility for any tax liabilities that may arise from winning a major or secondary prize.